My mission and purpose as a chiropractic physician is to help activate this innate healing response so that my patients, too, are able to carry out their life’s mission and purpose in abundance. Participation on your part is equally if not more important. You will discover many factors that affect your individual response to care and that taking responsibility, communicating openly, following instructions and seeing yourself well is the commitment we expect you to make to yourself. 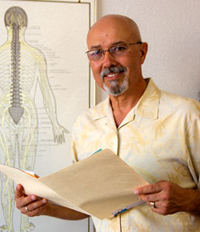 Serving Las Cruces and the surrounding area now for over 30 years, my experienced chiropractic staff and I are passionate about chiropractic, exercise, diet and cellular nutrition. Begin your journey towards better health today by consulting the Las Cruces area chiropractor dedicated to you and natural health care. Learn more about my story and chiropractic background. Start the path to wellness today, call our Las Cruces office and make an appointment.